I was slightly confused when I first heard that “adult colouring” was a “new craze”. I haven’t really stopped colouring in since I was a child. Perhaps, it’s because straight from school I trained to be a teacher, then became a teacher and now of course have children of my own so there has always been a reason for me to colour. I am glad for this craze however, as there has been a surge of new colouring in books for adults on the market. In the past if you wanted something more challenging, your only options were to draw it yourself or colour in mandalas. 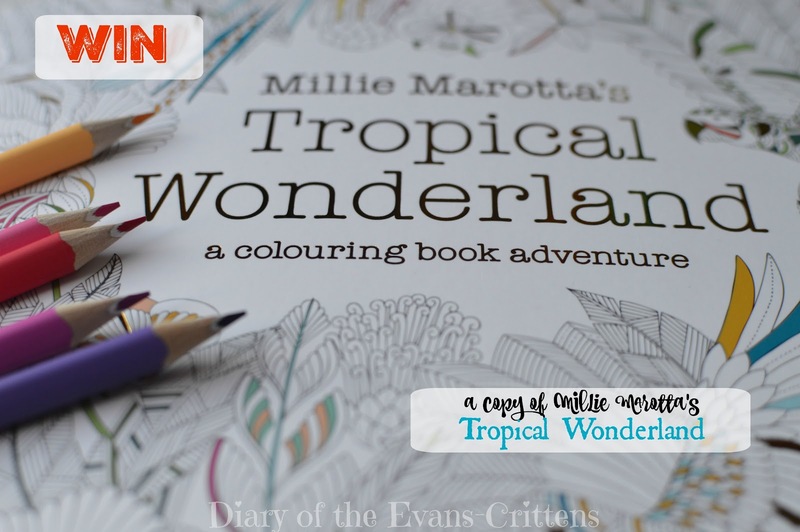 Therefore I couldn’t wait to get a copy of Millie Marotta’s Tropical Wonderland: a colouring book adventure (and will also be giving one away at the end of this post). This colouring book has proved extremely popular. In the space of only six months since the book was published, Millie Marotta’s Animal Kingdom has sold over 500,000 copies worldwide in countries ranging from Lithuania to Korea, Spain to Japan and foreign language rights have now been sold in 26 different languages. Millie Marotta is a freelance illustrator who lives in Tenby, not far from me. Millie’s intricate style of illustration encourages you to make your own mark, whether it’s to add to the fine lines on trees or add a splash of colour to the feathers of a tropical parrot. Explore the rainforest further and you will find extraordinary flowers, birds, butterflies and reptiles, including a rainbow boa with shiny scales crying out for a touch of colour. This book will bring enjoyment to anyone who is looking for a creative outlet or a mindful and relaxing activity. The colouring book trend shows no sign of abating as more and more adults turn away from their electronic devices and look to colouring as a way to relax and escape the stresses of modern life. When I first opened the book and my newly sharpened pencils, I wondered if I should start from the beginning and go through or dip in where I fancied. I went with the latter. I spotted a butterfly that I couldn’t wait to colour in bright shades. For some reason though, I couldn’t start with the butterfly. I had to first shade the leaves, stem and plant that the butterfly had landed on, so there I began. I imagined that these would all be bright shades too, but instead was drawn to Autumnal colours, perhaps the view out of my window at the time influenced me. There is no right or wrong, just colour how and when you want to. I didn’t have time to complete the butterfly before picking my daughter up. I stopped for a break as I made her lunch and made a rooky parent error. I left my colouring book and pencils out on the table. A certain young lady wanted to be helpful and finish my picture for me so had coloured it in. She was so sweet describing which parts she had coloured, so I of course could not blame her. However, If you want to keep your colouring book solely for your use then do remember to put it out of reach! I’m looking forward to colouring more of this exquisite book, especially this elephant. It’s so relaxing and a refreshing change away from the computer screen or TV. I’m making an effort this winter to read, draw, colour and craft and not just while away hours on facebook. Do you like colouring? Win your own copy of Tropical Wonderland in the raffle copter below. Good luck! and her first book Millie Marotta’s Animal Kingdom – A Colouring Book Adventure on Amazon- they make great Christmas gifts too! It helps me to relax and unwind and I can extress my imagination and creativity! Colouring allows me to quietly think things through whilst allowing myself some me time and giving myself time to consider all implications.Also ending up with something beautiful to soothe the soul!! Colouring is calming and mind-expanding! I love colouring and it gives me a break from staring at my laptop!